Water Barracks and the Bridge are part of the SNG complex in Bratislava that served for exhibition purposes.Water Barracks are the oldest part of the complex, where the institution began its operations. In the former building of city police on the Danube embankment (residence of Hungarian Sappers before then), used to be so-called Hygiene Museum after WWII, later the popular club Taranda used these premises. 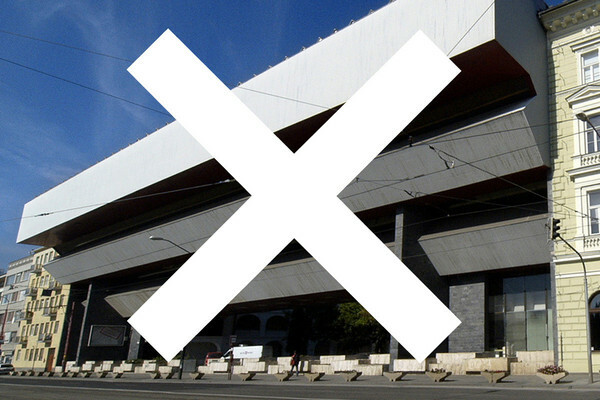 The building of the SNG, situated on (then) the largest promenade in Bratislava, belongs to important architectural monuments in this area. Originally four-winged baroque disposition from the years 1759 - 1763 (former chronogram, located on the buttresses of the object, resembles the year 1761), was created according to the decision of the Hungarian Royal Construction Chamber, following the Teresian reconstruction of the Bratislava Castle, probably by architect G. B. Martinelli and F. A. Hillebrandt. The construction itself was led by the future creator of the Mirbach Palace in Bratislava (1768 - 1770) M. Höllrigl. After 1940, the entire southern wing of the palace was demolished, which led to change into open three-winged shape it has now. The building was then adapted for the purposes of the gallery, with minor interior modifications (architects F. and K. Rosmány Florians), during 1950-1955. Subsequently, when they considered the question of the completion of the SNG, the question of architectural finalisation of the building arose again, mainly when it came to expanding the exhibition spaces. In 1957, on the basis of suggestion and incentive for the reconstruction of the building (architect E. Bellus), the invitation to tender for the architectural design and urban redevelopment of the gallery was issued in 1963. Its implementation was carried out from 1969 to 1977 by the winner of the tender, architect Vladimir Dedečka. The most famous and the most controversial part was the exhibition area known as the Bridge. Today, it is the jewel of neo-Modernist architecture in Bratislava. In 2001, these premises were closed by the general director of the SNG, Katarina Bajcurová, because of their state of disrepair and they await reconstruction ever since.